Our range of CCTV hardware & accessories complements our portfolio of IP cameras, video recording solutions and networking equipment to provide a complete IP CCTV offering suited for network camera installations of any size. As with our choice of camera and recording equipment, all accessories we offer are of established manufacturers and a high quality standard. In addition to the supply of equipment, we provide free helpdesk support to our customers and also offer installation, training and system commissioning. We can help you with system design, choosing the right camera and provide advice on compatibility and functionality between products. 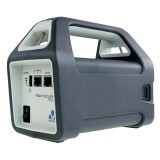 Connect a laptop directly to the unit for a network connection to camera equipment in locations without a local power source. All aspects of the camera image can then be easily viewed and adjusted, making installation and testing a quick and simple task. Axis T8351 discreet, omni-directional microphone - optional extension cable. Outdoor-ready IR illuminator with up to 120° beam angle and a maximum 144m distance. Videotec Punto outdoor enclosure with built-in heater, suits most box-style cameras. Axis C3003-E network horn speaker ideal for IP-based CCTV system integration.